Chip ‘n Dale Rescue Rangers – I have fond memories of this TV show. One of my favorite characters was Monterey Jack, a mouse who loves cheese (very tricky, Disney, using an actual cheese for the name of a character). I think we must have watched this show right as it came out (many of the others we only watched after they had been in syndication for a while) and I thought it was pretty cool that these two established Disney characters now had their own detective show, and the fact that Chip dresses like Indiana Jones certainly didn’t hurt things. Disney’s Adventures of the Gummi Bears – We didn’t watch this show a lot, but I remember it very distinctively. Actually, come to think of it, I might just remember it because they advertised it like crazy, which is typical of Disney. I do remember that one of the characters was voiced by the same actor (Lorenzo Music) as Garfield in Garfield and Friends. I didn’t buy it. He-Man and the Masters of the Universe – He-Man was an awesome show. As a kid, I always thought he was a lot like Superman, only better. By day he’s just the mild-mannered Prince Adam, but the power of Grayskull transforms him into the awesome He-Man (wow, that name sounds really dumb now, although I wouldn’t want to get in a fight with him for making fun of his name). Despite the similarities with Superman, it was He-Man’s enemy that set him apart. Skeletor was awesome, just look at the guy. He was a purple muscleman with just a skull for a head, but he was no dummy. The great part about this show was that it was so easy to pretend you were He-Man: all you needed was a pair of red shorts and a big sword. It surprises me that I didn’t do that more often. My Little Pony – We rented a few of these episodes on Netflix for my daughter to watch, and she enjoyed them a little bit, although she definitely likes playing with her knock-off pony toys. Like Rainbow Brite and many others, they had their own movie. This show definitely appealed to little girls who were into hair and fancy things, though, and the toys carry on that tradition today. Hasbro was the creator of these toys, though, so maybe after they stop making Transformers and G.I. Joe movies (which are based on their other toys series) they will move on to My Little Pony. Just maybe. The New Adventures of Winnie the Pooh – One of the highlights of my young life (if you read my journal, at least) was meeting Winnie the Pooh in the mall when I was a kid and getting some stickers and a poster for this show. When I was flipping through channels a while ago, I noticed that there was a new Winnie the Pooh show on TV, but it had a little girl in place of the beloved Christopher Robin. I’m sure it’s all about a new generation or whatever, but I had to flip the channel immediately for fear of corrupting my two young daughters. Lots of 80’s TV shows have come back, but I can’t think of any that are better than the originals. A. A. Milne would be rolling over in his grave… if he hadn’t already done so back when his widow sold his characters to Disney. Pound Puppies – this was one of a few 80s cartoons that also had a movie that came out with it, and it also belongs to the category of TV shows inspired by toys. There’s nothing wrong with that, though, as the movie, Pound Puppies and the Legend of Big Paw, brings back lots of good memories of the summer movie series we used to go to when we lived in Missouri. At the beginning of the summer my mom bought punch passes for all of us that would get us in to see a movie every week or so during the day. We always brought popcorn and other snacks as we watched the movies. I can’t think of any of the other movies that we saw that summer, but I do remember seeing the Pound Puppies movie. The Real Ghostbusters – Unlike another 80’s cartoon called Ghostbusters (which I only vaguely remember), this one was based on the popular movies, and because of all the marketing promotions, kids liked this show more. Later on, they figured out that kids really liked Slimer, so they renamed the show “Slimer! and the Real Ghostbusters”. Interestingly, Lorenzo Music voiced Bill Murray’s character from the movies in this show, and Bill Murray went on to voice Garfield, Lorenzo Music’s most well-known character, in a couple of movies. 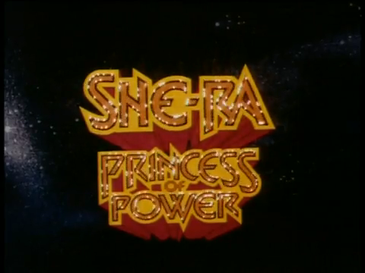 She-Ra: Princess of Power – I’ve already mentioned that She-Ra was one cartoon that featured a girl that a boy would be fine watching even if he didn’t have any sisters. I know that my sister had a She-Ra action figure (or does this count as a doll?) that she got to use while my brother and I played with He-Man and Skeletor. She-Ra is actually He-Man’s twin, so obviously there are a lot of similarities between the two. Shirt Tales – When we were kids, my mom sewed a bunch of stuffed animals from patterns for all of us, including several Care Bears (there must have been between ten and twenty which was awesome because we could line them all up for a Care Bear stare) and a few of the characters from Shirt Tales. Just like the Care Bears were based of popular American Greetings cards characters, the Shirt Tales were based off of characters created for Hallmark. I only remember watching the show once or twice, but I thought it was awesome because it featured one of my stuffed animals. I also remember that they had a really cool car that they drove around in, which according to Wikipedia, is the “STSST (Shirt Tales’ SuperSonic Transport) which could operate as a car, jet, boat, submarine, and just about any other form of imaginable ride”. Nice. Smurfs – I have fond memories of the Smurfs, and Gargamel was one of my favorite villains. This was another show that we rented recently from Netflix, and it was kind of funny to go back and watch it again. We enjoyed that the Smurfs could use the word “smurf” as any type of word, but depending on the context they used it in it often sounded like those innocent little blue creatures were swearing. I was also surprised to find out that Smurfette was originally created by Gargamel, and she wasn’t always the sweet little thing she is now. How smurfy of them. Snorks – I loved the Snorks, and I wanted to be just like AllStar. He was your typical Renaissance Snork, who, “as well as being athletic and heroic, he’s interested in Science and also an inventor”. Not too bad for a little underwater creature that hung out with seahorses. When my mom used to take use to the genealogy library at church when we were little, we rented a tape of Snorks from the nearby Dillon’s supermarket one time, which was totally awesome. Personally, I think the Snorks were much cooler than the Smurfs, and interestingly, they were both created in Belgium. Strawberry Shortcake – this may have been the first of the 80s cartoons to feature characters that were created for greetings cards. I remember my sister being a big Strawberry Shortcake fan, and she even had a Strawberry Shortcake bike, which was the same bike I learned to ride on. From my perspective, this was one of the more tolerable girl cartoons, and even today my three-year-old daughter knows who Strawberry Shortcake is. Be warned that watching this show can make you hungry, though, although you wouldn’t want to eat Strawberry Shortcake or any of her friends like Huckleberry Pie, Blueberry Muffin, or Lemon Meringue. Even though they have delicious-sounding names, it’s still considered cannibalism. This entry was posted in Nostalgia on Friday, August 7, 2009 by Alex.